G'day ! 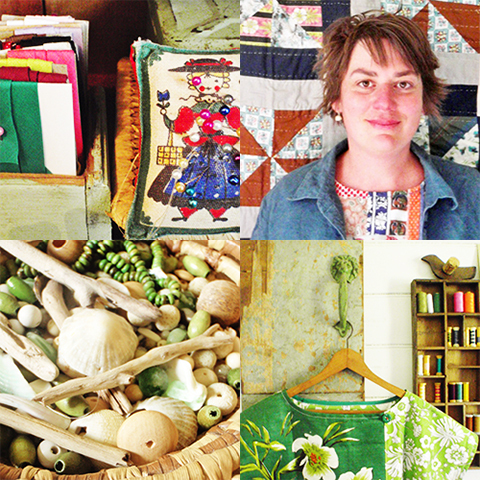 My name is Sarah, owner & maker at apieceofpie and face behind the Pie in the Sky label. I live on the beautiful NSW South Coast with my partner and our two beautiful children. We live in an old farmhouse nestled between the bush and the beach. We love it. When it comes to making I guess I have my finger in a few crafty pies. I make a women's range of vintage inspired clothing. Childrenswear, again using repurposed vintage fabrics. And also a range of bird mobiles made from upcycled beads of endless shapes,colours and sizes. At the moment sewing is what I do the most of. Contemporary patchwork in particular. My "scrap" basket overflows (seriously) with potential patchy possibilities. I love linen in all its forms but especially vintage tea towels and kitchen usefuls. Vintage fabric is another favourite. The colours and patterns/prints are a joy. I guess that's also why I enjoy patchwork so much. It means I never have to discard a beautiful piece of fabric. In fact I keep even the "snippets" for a friend who makes lovely brooches. So it all gets used,nothing is wasted. Beads are high on the collecting agenda, to use in my "Flock of Birds" Mobile range. Mostly sourced from thrifted necklaces and jewellery, but also the occasional bead curtain or massaging beaded car seat cover(you know the ones) basically if it has beads, i'll use it. Like so many mothers I would have to say my children were my initial inspiration. What you see in my shop is a direct result of my makings for my children (nearly 5 yr olds Alice & Henry) and also myself. I have some inspiringly talented friends that ideas are often bounced off. They inspire me for sure. I'm a very colour driven person, so i'm always looking to nature for inspiration also.Interesting colour combinations that aren't often obvious but always seem to work. All pieces are handmade by myself. My gorgeous Dad (also known as "birdman") does an annual cutting of the birds used in my mobiles. A years supply, that's a lot of birdies!! It's a huge help. Other than that its all made by myself. My creative process always starts with colour. Whether I am making a bird mobile or patching pieces of fabric together. It's the same process. I collect the beads or fabric in the colour combination that I want. Often(but not always) balancing combinations with more natural tones. I'm a very hands on maker. Me and my Makita drill, pins, needles, the Janome. All of that. I like to think I make things that are authentically me and when seen are recognised as Pie in the Sky. I can't really recall a time when I wasn't making. I have had my Pie in the Sky label for about 13 years now. I guess after having our children and being at home with them allowed me more time and flexibility to dabble and explore different creative outlets. I've always enjoyed making and Pie in the Sky is a collection of these pieces. I think it was just something that I liked the sound of the name Pie in the Sky despite there being no real link or relevance to my work. I now know there are many Pie in the Sky this and Pie in the Sky that's. Maybe i'll change it one day, who knows. I am a self taught maker so am often reaching for books or you-tubing a new technique. You-Tube.. fantastic!. Facebook of course is fantastic for reaching the masses and letting people know you're there. It's easy,free and fun too. Same goes for pinterest! The good old telephone is a wonderful resource for me. Workshopping ideas with friends and keeping in touch at the same time. I am also keen to do some classes/workshops once my kids are off to school. Pottery/Ceramics specifically. New adventures. My best advice to someone thinking of starting up is to make what you love. Listening to your instincts and making something that is uniquely yours is an incredibly satisfying process. Even more so when somebody buys it!!! Putting yourself out there can be daunting. I remember the first time I showed one of my mobiles to a potential retailer, a beautiful vintage styled florist in Wagga Wagga. I never thought there was a potential market for them. Now they are found in homes not only in Wagga and surrounds but across Australia and abroad. Trust your own unique talents! If you're not a great photographer learn to be one! This is something I'm still trying to perfect. Great images are what will sell your product,or not. Use all of the thumbnails provided. The more shots that a customer can see the better. I also recommend keeping your shop as fully stocked as you can. More products mean more views and more potential sales. It also gives the customer more to choose from. A fully stocked store also looks great. Using social media is the only other form of advertising that I have used apart from good old fashioned word of mouth. Both Facebook and Pinterest are great for bring traffic to your shop. Being featured in newsletters or on the madeit front page are also fantastic promotional opportunities. Hmmm... I haven't had any bad experiences. Like everything there are lessons to be learnt along the way. I think pricing is something that I have struggled with and i'm sure i'm not alone. Valuing what you make, the time involved in production,costing of materials and also the value of the design. Learning to create items that work visually are cost and time effective and are also desirable. That's been my biggest lesson so far. I love my garden. When I step away from my sewing machine it's out into the garden. Weeding, watering, pruning, and even mowing. I find it all so enjoyable. I also love to cook and preserve produce. Summer is a busy time!!! But having a cupboard full of jams, sauces and chutneys makes it well worth while. For relaxation I love to spin. Yes it's creating but I find the process relaxing.... no need for thinking. You can just let your mind go. I sometimes feel like I have a nanna living inside of me! My fave TV show is easy - American Pickers! Love those Pickers! I also really enjoy Grand Designs. Music - Joni Mitchell, Eilen Jewell, Gillian Welch. Acoustic folky style is what I love. Book - Perfume by Patrick Suskind. Awesome! Website - Linnet. A Japanese company that produces small batches of handcrafted linen fabric. Stunning! I'm not really a film buff, I leave that to my partner. I always seem to fall asleep before the end! My perfect day is simple. It would be me wandering around an unknown city by myself. Exploring, window shopping, wandering down interesting looking side streets. Taking my time. Stopping for coffee and cake (there must be coffee & cake involved). That sounds perfect to me. chipandbunny - Beautiful fabrics ,beautifully sewn. If only they were BIGGER!! !